As record warm temperatures strike the U.S., 600 activists marched to Governor Terry McAuliffe’s house on Saturday to demand that he put the welfare of people ahead of the interests of polluters. 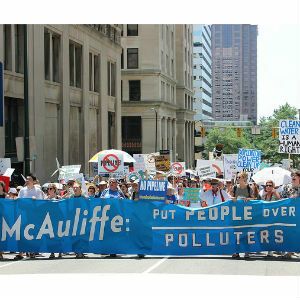 Waving banners that included “McAuliffe: Climate Justice Can’t Wait,” the protesters demanded that the Governor become a full-time champion of renewable energy solutions, and stop supporting fossil fuels that harm communities and worsen global warming. The “March on the Mansion” brought together people from Norfolk to Northern Virginia to the New River Valley who face first-hand effects from dirty energy policies that Gov. McAuliffe supports. Farmers whose land is threatened by the proposed Atlantic Coast Pipeline and Mountain Valley Pipeline marched shoulder-to-shoulder with Virginians whose drinking water is polluted by coal ash and coastal residents whose homes are being flooded by rising seas. With colorful signs, chants, songs, and a 40-foot-long mock pipeline, rally-goers paraded from Brown’s Island Park along the James River to Capitol Square, calling on the Governor to listen to their voices and stand up to polluters like Dominion Resources and EQT/NextEra. Rally speakers included Pastor Paul Williams, a minister in a primarily African American community in Buckingham County, the proposed site of a massive compressor station for the Atlantic Coast Pipeline; Carolyn Reilly, whose family farm in Franklin County would be divided by the Mountain Valley Pipeline; and Dan Marrow, whose family lives near Dominion’s Possum Point coal ash ponds and is forced to drink bottled water due to trace contaminants in his well water. Nebraskan Jane Kleeb, a key leader of the “Cowboy and Indian Alliance” that defeated the Keystone XL pipeline, also joined Saturday’s rally in solidarity. The event came on the heels of a new report showing that the surge of fracked-gas pipelines proposed in Virginia and across the Appalachian basin are incompatible with a safe climate future, and fail the “climate test” applied to Keystone XL. More than 60 landowner, social justice, faith, student, riverkeeper, and climate groups organized and endorsed the rally, demonstrating the growing movement across Virginia calling for swift and serious action to transition to sustainable and just energy. The groups will continue working together to challenge the stranglehold that polluting companies have over energy policy in Richmond. Oppose gas and oil projects that hurt Virginians and our economy, including using state authority to deny Clean Water Act permits for proposed fracked-gas pipelines. The proposed Atlantic Coast and Mountain Valley Pipelines, related compressor stations and gas plants, and offshore oil rigs will worsen the climate crisis and create racial, rural, and economic sacrifice zones when affordable clean energy alternatives are available. Stop supporting reckless coal ash disposal plans that pollute rivers and drinking water. The Governor and the Department of Environmental Quality must reject utility company plans to dump millions more gallons of coal ash wastewater (containing toxic heavy metals) into our rivers and to bury the ash in unlined pits. Coal ash must be properly isolated and stored in a way that permanently protects our water. Explicitly commit to reducing total climate pollution from Virginia power plants through federal and state clean power rules. The Governor must reject Dominion’s plan to increase climate pollution from power plants. Instead, take positive action to protect public health and natural resources, and ensure a transition to renewable energy.